North Carolina is the unlikely setting for this week’s Five Takeaways. It was where Alexandra Malone, the protagonist of our story, first saw people carrying something unusual down the street. Hula hoops. “I used to live in North Carolina, and hula hooping is really big there – it’s actually one of the main hooping centres in the US,” she says of the sparsely populated state. Several years later, Malone is now a hooping teacher in Ottawa. Below, she provides the five takeaways of hula hooping. 1. There is more to hooping than flinging a hoop around your waist and awkwardly gyrating. “The basic skill is being able to move the hoop around your waist. To do this, you need a strong core, as well as balance and coordination, which you can develop through hooping. The second move is bringing the hoop from your hips to your waist,” says Malone. “Then there are a couple more advanced moves. One is chest hooping, where you bring the hoop up to your chest with your hands above your head. Then there’s shoulder hooping, neck hooping, and hooping with the thighs and knees. There is also hooping ‘off the body’, where you are using your hands to spin the hoop or move it around your body,” Malone explains. 2. 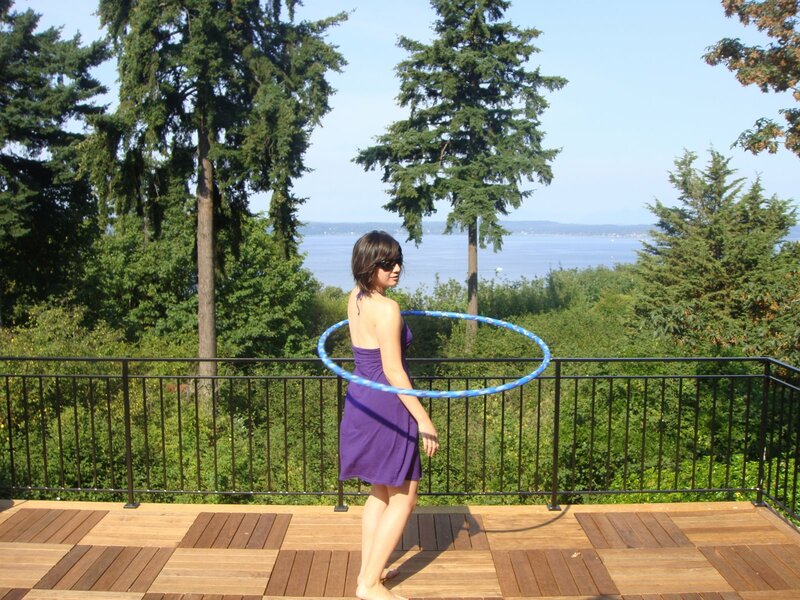 Hula hooping is not really a competitive sport, but more about performance or fitness. “Don’t get me wrong – there are competitions, Guinness Book of World Records “who can hoop for the longest duration” type events, but most hoopers are more focused on performance and teaching and sharing. The performance aspect is the most prominent one – you’ll often see hoopers performing at festivals like Burning Man, or events like Cirque du Soleil, or even filming short hooping videos to post on YouTube” explains Malone. 3. Hula hoopers are mostly female, but beyond that there isn’t a specific age demographic. 4. Hooping is exercise cleverly hidden in nostalgia, self-expression, and amusement. “Hooping has a whole range of health benefits – obviously it’s a good cardio workout and helps you strengthen your core, and increase muscle tone. And it’s also really low impact, and helps with balance and coordination. But beyond that, it reminds you of being a kid, and as you get more comfortable, it is extremely creative and people use it as a mode of expression, and even stress relief. I’ve even seen people doing ‘meditative hooping’!” she exclaims. “I’ve also taught people who are trying hooping for the first time and spend the whole hour laughing, so even if you don’t get the hang of it right away, most people want to keep at it because they’re having so much fun!” laughs Malone. Malone makes her own hoops for herself and sometimes for her friends. “Some teachers have business making hoops and selling them. It’s not that difficult – hoops are made out of polyethylene plumbing tubing, the kind that you use for radiant floor heating – and you can get them in all kind of weights and diameters. There is a specific weight and diameter for a basic beginner hoop for adults, which is 3/4 inch 160psi. If you’re more advanced, you get the tubing with a smaller diameter, and lighter weight, which makes it more difficult to control with your body. Then, you cover your tube in pretty tape, and you’re done!” she explains. Malone teaches classes at Fitness Fusion in Ottawa. Find out more information at www.fitnessfusionstudio.com or by emailing hoopersonic@gmail.com.